NetCup Review 2019: Is NetCup a Good Hosting? With dedicated on-site personnel and 99.6% SLA uptime, NetCupEU is a trusted partner for shared hosting, domains, SSL certificates, and root server management. With over 10 years of experience, Netcup.eu is a trusted provider of web hosting, colocation, and server management solutions. Netcup serves over 40,000 customers around the world. The company’s servers are located in a private facility in Nuremberg, Germany. NetCupEU offers high performance servers which are supported by cloud infrastructure. With 99.6% uptime, NetCupEu’s servers are among the best in the hosting industry. They use high-grade server equipment with fully redundant power supply and multiple network connectivity. When you sign up, you get brand-name hardware with powerful CPUs, lots of RAM, and foolproof hard disks; NetCupEu is your best bet. If you’re concerned about data security, you will be happy to know that NetCupEu takes customer confidentiality and data security seriously. They store data in foolproof servers that are fully-equipped with RAID hard disk mirroring. Should one disk fail, another disk will take over the operations as technicians replace the defective machine. Since there are no shared hosting plans, NetCupEu doesn’t overload servers with customer accounts. Scripts and apps run faster than other hosting services that I have used. From what I can gather, you can terminate your contract if you feel their servers are slow and ask for a full refund. The WCP administration interface gives you full control of your webspace. You can manage your SSH, emails, server space, domains, files, and security. With the one-click installer, you can set up your blog, website, forum, or e-store in a few minutes. NetCupEu offers four hosting plans with incremental features. The introductory plan is known as the Webhosting 1000. It comes with 1 free domain, 50 GB SSD storage, and a free SSL certificate. The next tier is the Webhosting 2000 plan, which includes all the standard features of the introductory plan as well as a WordPress toolkit. Next up is the Webhosting 4000 plan, which comes with 2 domains, 500 GB SSD storage space, 25 databases, 1000 mailboxes, an SSL Certificate and scripting languages, such as Ruby and NodeJS. Webhosting 8000 is the ultimate plan. It includes SSH access, 3 domains, 2000 mailboxes, 50 databases, 1000 GB SSD storage space, and scripting languages. All four plans also include SSH access, IP6 Addresses, and automated daily backups. If you’re not happy with your hosting package, you can cancel the order within 30 days. Sometimes businesses outgrow their hosting plans or find that existing plans aren’t technically feasible. If you require more resources, you can upgrade from your current hosting plan to a higher level plan and get more space. It’s a smooth process that also unlocks more features. NetCupEu provides 24/7 support to their customers. They have friendly and qualified personnel who can sort out your billing, sales, or technical issues in no time. You can reach them via live chat, ticketing system, or email. Telephone and email support is also available round-the-clock. Typical responses via ticket take 2 hours at most. With NetCupEu, you should never have to worry about your server going down. Technicians are on-site day and night to ensure your Windows or Linux servers are up and running. If there’s a hardware fault, they can troubleshoot your server and restore operations within 15 minutes. NetCupEu offers redundant servers and hosting plans that are scalable and extensible to match your growing hosting needs. 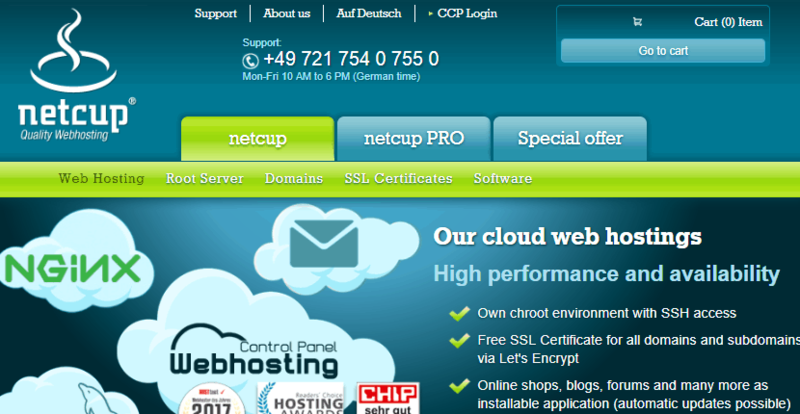 Wondering how NetCup stacks up against other Web Hosting companies? Enter any other Web Hosting company and we will give you a side-by-side comparison.